There are numbers of cheesecake fillings and toppings, but today we celebrate America's favorite. Blueberries with their mild flavor go well with soft and creamy cheesecake. 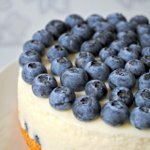 If you want to make perfect blueberry cheesecake to celebrate the holiday, then use a special topping. Mix 2 tablespoons of cornstarch with 2 tablespoons of cold water. Add 1/2 cup of water to 2 cups of fresh blueberries, half cup of sugar and 2 tablespoons of lemon juice. Cook the berry sauce in a saucepan over medium heat. Stir sauce frequently, until the mix boils. Stir in the cornstarch to berries and simmer the sauce until it's thick enough co coat the back of metal spoon. Remove blueberry sauce from heat and stir in vanilla extract and about 1 tablespoon of lemon or orange zest. Cool the berry sauce and use it to serve your cheesecake. Share the cheesecake with your family and friends. Happy National Blueberry Cheesecake Day!